Homelessness: What Can We Learn From Finland? 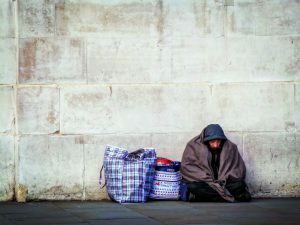 What Can Students Do to Help the Homeless? What Do Food Banks Do? Anyone who lives in Southampton knows that there’s a large homeless population. Simply walking into university in the morning, if you live in the gorgeous area of Portswood, guarantees you passing by at least three homeless people. I know so many students want to help, but most would hesitate to give out money. Although it may not always be true, people assume that the money will go to drugs and alcohol and won’t do any good. Homelessness is an issue which could affect anyone. A recent survey by YouGov and Shelter found that nearly four million families were only one paycheque away from losing their homes, and that 2.4 million families would lose their home immediately if they lost their jobs tomorrow. Finding a way to support people in this situation is crucial. The Megabite Scheme, run by Scratch Charity, offers a solution. I’m a student at the University but I am currently working as an intern on this project, and as soon I read about it I fell in love with it. It’s simple but it offers a much better alternative to money. You can purchase Megabite Meal Squares for £1 each from Scratch and hand them out to people in need, such as those living on the street. These vouchers can then be redeemed at certain food outlets across the city, meaning that the person can get a healthy meal for free. This doesn’t even cost the businesses anything as they then redeem the vouchers with Scratch and get fully reimbursed. It’s as simple as that. This way you know where your money is going and you can genuinely help someone in need. As well as this, the outlets we work with are mainly community spaces, meaning that they provide additional social interaction for the customer. Access to cheap and healthy food is a struggle for everyone (anyone on a student budget knows the pain) but this is a way to guarantee it for those in need. For more information, visit the Scratch charity website. Alternatively, there should soon be a Megabite stall appearing on campus so watch this space!